Stress signaling pathways activated by tissue injury set up precise spatio-temporal patterns of apoptosis, proliferation and survival that are required to repair a tissue (Fuchs and Steller, 2015; Sun and Irvine, 2014). Accordingly, deregulation of injury-induced signals and cell behaviors are associated with ageing or pathologies, such as non-healing chronic wounds and cancer (Martin and Nunan, 2015; Neves et al., 2015; Taniguchi and Karin, 2018). However, how injury-induced signals precisely balance proliferation and apoptosis to restore a tissue of the correct size is still not fully understood. Cell proliferation during tissue repair is regulated by controlling cell cycle progression, promoting re-entry of quiescent cells into the cell cycle or accelerating cell division rates. In contrast to acceleration, tissue stress can also induce cell cycle arrest. Excess cellular damage or deregulated signaling environments cause cells to arrest in G0 and enter senescence - a state characterized by resistance to apoptosis and senescence-associated secretory phenotypes (SASP) (Hernandez-Segura et al., 2018; Neves et al., 2015; Pluquet et al., 2015; Salama et al., 2014). SASP is linked to persistent production of signaling molecules, secretion of ECM degrading enzymes, as well as an upregulation of autophagy, unfolded protein response (UPR), ROS and an increase in cell size (Hernandez-Segura et al., 2018; Neves et al., 2015; Pluquet et al., 2015; Salama et al., 2014). Strikingly, recent studies suggest that senescent cells are required at wound sites to promote wound closure and cell plasticity (Demaria et al., 2014; Ritschka et al., 2017) and in development to promote morphogenesis of embryonic structures (Davaapil et al., 2017; Muñoz-Espín et al., 2013). Thus, while cell cycle arrest and senescence are often considered to be an aberrant by-product of stress responses, it emerges that arrested cells interface in a little appreciated way with physiological events during tissue regeneration. Drosophila imaginal discs (Figure 1—figure supplement 1A) have provided deep insights into stress signals and responses to tissue injury. The JNK/MAPK-cascade is among the earliest pathways activated by physical wounding (Bosch et al., 2005; Rämet et al., 2002), loss of epithelial polarity (Igaki, 2009; Igaki, 2009) or apoptosis (Ryoo et al., 2004; Shlevkov and Morata, 2012). JNK activates multiple transcription factors, such as AP-1 (Eferl and Wagner, 2003; Külshammer et al., 2015), and is required for wound closure (Bosch et al., 2005; Ríos-Barrera and Riesgo-Escovar, 2013), elimination of damaged cells (Chen, 2012; Moreno et al., 2002; Shlevkov and Morata, 2012) and compensatory proliferation replacing lost tissues (Bergantiños et al., 2010; Bosch et al., 2008; Ryoo et al., 2004; Sun and Irvine, 2014). Feed-back loops acting through ROS, p53 and the initiator caspase Dronc maintain JNK activity until tissue homeostasis is restored (Brock et al., 2017; Khan et al., 2017; Shlevkov and Morata, 2012; Wells et al., 2006). However, how JNK signaling is balanced to eliminate damaged cells and to promote compensatory proliferation is little understood. Apoptotic cells stimulate compensatory proliferation of the surrounding tissue by JNK-dependent activation of growth and survival pathways including Hippo/Yorkie and JAK/STAT (Fuchs and Steller, 2015; Pastor-Pareja and Xu, 2013; Sun and Irvine, 2011; Zielke et al., 2014). Importantly, preventing execution of apoptosis in damaged, aberrant or tumorigenic cells causes chronic signaling and non-autonomous overgrowth in fly tissues (Fuchs and Steller, 2015; Herz et al., 2006; Martín et al., 2009; Pastor-Pareja and Xu, 2013; Pérez-Garijo et al., 2004; Pérez-Garijo et al., 2009; Ryoo et al., 2004; Uhlirova et al., 2005). However, which autonomous and non-autonomous mechanisms drive compensatory proliferation remains to be fully elucidated. We employ surgical injury of wing imaginal discs (Bryant, 1971; Yoo et al., 2016) and cell ablation induced by pro-apoptotic transgenes (Herrera et al., 2013; Smith-Bolton et al., 2009) to study how injury-induced JNK signaling, compensatory proliferation and survival unexpectedly link to control of cell cycle progression. While stress-induced cell cycle arrest and senescence in flies are little understood (Nakamura et al., 2014; Wells et al., 2006), we propose that JNK-induced G2 stalling exhibits senescence-like qualities in Drosophila. To investigate how imaginal disc regeneration may be regulated by cell cycle progression, we induced acute surgical injury of wing imaginal discs in situ. Consistent with previous reports (Bosch et al., 2005; Mattila et al., 2005; Rämet et al., 2002), we observed activation of the JNK reporter puc-LacZ near the wound site 6 hr post-injury (Figure 1A–B). Strikingly, upregulation of the JNK reporter coincided with a pronounced shift of cells towards a G2-dominated cell cycle profile visualized by the G2-specific FUCCI reporter mRFP-NLS-CycB1-266 (Figure 1A’,B’; Figure 1—figure supplement 1B,C) (Zielke et al., 2014). We confirmed this finding by flow cytometry, where cells from injured imaginal discs positive for the alternative JNK-reporter TRE-RFP (Chatterjee and Bohmann, 2012) exhibited a pronounced G2-shift (Figure 1D,E). This response could be narrowed down to the injured pouch domain by flow cytometry analysis of rotund(rn)-GAL4, UAS-GFP expressing cells, which normally have little TRE-activity (Figure 1—figure supplement 1D-E'). Importantly, injury-induced JNK-activity and the G2-profile were transient events, as both decreased by 16 hr post-injury (Figure 1C,C’). These observations suggest that JNK activity correlates with a G2 cell cycle profile and that this correlation may be a transient component of physiological wound healing processes. Tissue injury induces a transient G2-shift. (A–C’) Undamaged control wing disc (A), a wing disc with surgical damage 6 hr (B) or 16 hr (C) into the recovery (R) period. Wing discs were counterstained with DAPI (cyan in A-C) and express the JNK-reporter puc-LacZ (red in A-C) as well as the G2-specific FUCCI reporter ubi-mRFP-NLS-CycB1-266 (see Figure 1—figure supplement 1B,C) visualized using a thermal LUT (A’–C’). Arrows indicate injury axis (B,C). A quantification of JNK reporter (TRE-RFP) activity over time is presented in Figure 5M. (D–E) Flow cytometry analysis of DNA content in undamaged control wing discs (D) and wing discs with surgical damage 6 hr into the recovery period (E). JNK-signaling cells in damaged discs were detected by activation of TRE-RFP. TRE-RFP positive cells in undamaged control discs represent only a 2.5% of the total cell population and are thus not separately visualized. Detected events were plotted as counts scaled to mode against fluorescence intensity of the DNA stain Hoechst. Scale bars: 50 µm. To more quantitatively investigate this cell cycle shift, we turned to models of tissue injury and regeneration based on targeted expression of pro-apoptotic transgenes. We first induced expression of TNFα/eiger (egr) under the control of rnGAL4 on developmental day 7, and limited expression to 24 hr by a temperature-sensitive GAL80-repressor (rnts>) (Figure 2—figure supplement 1A). As described previously, we observed extensive cell death resulting in reduced adult wing sizes (Herrera et al., 2013; La Fortezza et al., 2016; Smith-Bolton et al., 2009) and broad activation of the JNK-reporter TRE-RFP in and around egr-expressing cells (Figure 2—figure supplement 1B,C) (La Fortezza et al., 2016). Importantly, FUCCI assays revealed a pronounced G2-shift of cells at the center of egr-expressing domains (Figure 2A,B). Flow cytometry analysis confirmed that cells positive for TRE-RFP (Figure 2C,C'), and particularly the GFP-labeled lineage of egr-expressing cells (Figure 2—figure supplement 1B',C'), exhibit a pronounced G2-profile. The marked cell cycle changes prompted us to investigate if JNK-signaling cells were actively cycling. EdU incorporation assays (Figure 2A,B,D) and staining for phospho-Histone 3 (pH3) (Figure 2E,F) revealed that DNA replication activity and mitotic cells were absent from G2-shifted, TRE-positive domains in egr-expressing discs. Of note, TRE-positive G2 cells were larger in size than G2 cells from undamaged control discs (Figure 2—figure supplement 1D). Combined, these observations confirm a pronounced correlation between injury-induced JNK activity and a G2-dominated cell cycle observed in surgically injured discs and suggest that the G2 profile represents a cell cycle arrest. Stress-induced JNK activity correlates with G2-stalling. (A,B) Control wing disc (A) and a wing disc at 0 hr into the recovery period, after 24 hr of egr-expression in the pouch domain (B) (see Figure 2—figure supplement 1A). Discs also express the complete FUCCI reporter system consisting of ubi-mRFP-NLS-CycB1-266 (red) and ubi-GFP-E2f11-230 (green) and were analyzed for EdU incorporation (grey) to reveal DNA replication activity. The field of view includes the pouch and hinge domain of the disc. The horizontal G1 and G2 pattern in control discs (A) represents normal developmental pattern at the dorsal-ventral compartment boundary. Note the intensely labeled G2-cells lacking EdU incorporation activity at the center of the folded pouch tissue in the egr-expressing disc (B). (C) JNK-signaling cells in egr-expressing discs were detected by activation of TRE-RFP (red). Discs were counterstained with DAPI (gray). (C’) Flow cytometry analysis of DNA content in TRE-positive (red) and TRE-negative (gray) cells from egr-expressing discs. Detected events were plotted as counts scaled to mode against fluorescence intensity of the DNA stain Hoechst. (D–F) Control wing disc (E) and egr-expressing discs at 0 hr into the recovery period (D,F) expressing the JNK-reporter TRE-RFP (red). Discs were assessed for cell cycle activity by EdU incorporation to reveal DNA replication (cyan in D) and by staining for phospho-H3 to reveal mitotic cells (pH3) (gray in E,F). Note pronounced lack of either in JNK-signaling domains. (G–K’) Formerly egr-expressing discs at 0 hr (R0), 24 hr (R24) and at 72 hr (R72) into the recovery period. Discs were counterstained with DAPI (cyan in G-I) and either express the JNK-reporter TRE-RFP (G’-I’, red in G-I) or the FUCCI reporters (J,K). FUCCI-reporters expressing discs were assayed for EdU incorporation to reveal DNA replication (J’,K’). Compare J-K’ to B. A quantification of TRE reporter activity over time is presented in Figure 5N. Filled arrows point to the pouch domain where formerly egr-expressing cells and the regenerating tissue is located. Open arrows point to apoptotic debris. (L,L’) Flow cytometry analysis of TRE-RFP reporter activity, DNA content (Hoechst) and cell size (forward scatter, FSC). TRE reporter activity was divided into bins of RFP fluorescence intensity. Cells from four bins (negative, low, medium and high RFP intensity) were represented by different shades and plotted for their DNA content and cell size. 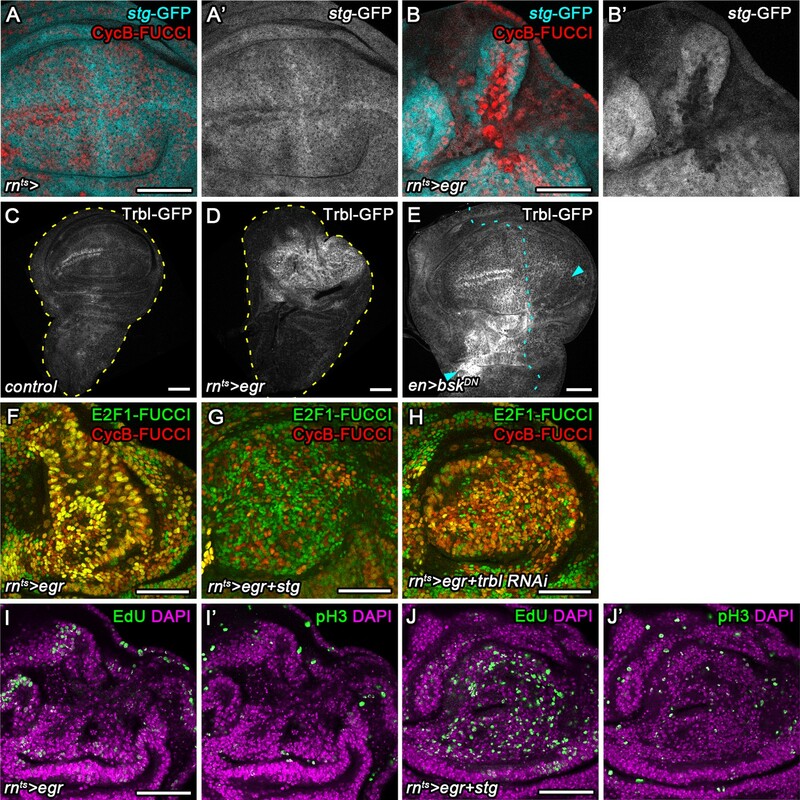 Note that cells in the high TRE bin are almost exclusively in G2 and are the largest in size. Maximum projections of multiple confocal sections are shown in A,B,D-F,J-K’. Scale bars: 50 µm. We wanted to investigate the fate of G2-arrested cells and understand if they reversed to active cycling after egr-expression had ceased. Previous lineage tracing of rnGAL4 positive cells surviving egr-expression indicated that mitotic rates increase 24 hr into the recovery period, which is followed by an increase in total volume of this population by 48 hr (please refer to Figure 1A,D,F in La Fortezza et al., 2016). To independently confirm that G2-arrested cells resume mitotic activity and cellular growth, we analyzed how JNK and cell cycle activity changed during the recovery period. When we analyzed TRE-activity in egr-expressing discs at 24 hr into the recovery period, we observed decreasing but still pronounced JNK activity (Figure 2G-H'). FUCCI analysis and EdU incorporation indicated the presence of G2 cells but also of isolated events of DNA replication activity at the center of the pouch (Figure 2J,J'). However, 72 hr into the recovery period, TRE-reporter activity was strongly reduced (Figure 2I,I'), and FUCCI as well as EdU incorporation assays revealed actively cycling cells (Figure 2K,K'). Combined, these results suggest that JNK-induced stalling of the cell cycle in G2 is reversible. However, unlike surgical injury where JNK-activity declined by 16 hr, stalling persisted much longer in egr-expressing discs. This temporal correlation between JNK activity and G2-stalling is also reflected by dose-sensitive responses. Specifically, TRE-reporter activity scaled with the proportion of cells in G2 and also with stalling-associated increase in cell size (Figure 2L,L'). We thus suggest that injury-induced stalling of cells in G2 represent a dose-dependent response to spatio-temporal JNK activity. For our study, we will use the term stalling to refer to a transient G2 shift induced by temporally limited JNK activation and use the term arrest when we want to emphasize prolonged stalling of G2 in response to high and persistent JNK activity. The strong correlation between JNK-activity and a G2-dominated profile indicated a direct regulation of G2-stalling by JNK. To test this hypothesis, we transiently expressed a constitutively active form of JNKK Hemipterous (hepACT) in the disc pouch using rnGAL4. FUCCI analysis indeed revealed a cell cycle shift towards G2 and absence of DNA replication (Figure 3A,A'), indicating that JNK is sufficient to induce G2-stalling. Testing the necessity of JNK for G2-stalling in egr-expressing disc is challenging, because interference with JNK abolishes the apoptotic stimuli mediating egr-induced cell death (La Fortezza et al., 2016). To circumvent this issue, we applied acute surgical injury to wing imaginal discs expressing a dominant-negative form of the JNK Basket (bskDN) in the posterior compartment using enGAL4. As expected, inhibition of JNK blocked upregulation of the JNK-reporter puc-LacZ in the posterior compartment of injured discs (Figure 3B). Importantly, it also prevented a cell cycle shift towards G2 at the site of injury (Figure 3B’). Taken together, these data demonstrate that JNK-signaling in response to tissue damage is sufficient and necessary to induce G2-stalling. JNK activity is necessary and sufficient for G2-stalling. (A,A’) A wing disc expressing a constitutively active JNKK hepACT in the pouch, assayed by FUCCI reporters (A) and EdU incorporation (A’) for cycling cells. At the center of the pouch, a G2-shifted cell population lacks EdU incorporation (arrow in A’). (B,B’) A wing disc with surgical damage 6 hr into the recovery period and expressing bskDN in the posterior compartment (on the right-hand side of the dotted line) under control of engrailed(en)GAL4. Wing discs were counterstained with DAPI (cyan) and express the JNK-reporter puc-LacZ (red) as well as the G2-specific FUCCI reporter mRFP-NLS-CycB1-266 (thermal LUT). Arrows indicate axis of surgical injury verified by tissue deformation in basal sections. (C,C’) The peripodium of a wild type disc counterstained with DAPI (cyan in C’) and expressing the JNK-reporter TRE-RFP (C, red in C’). 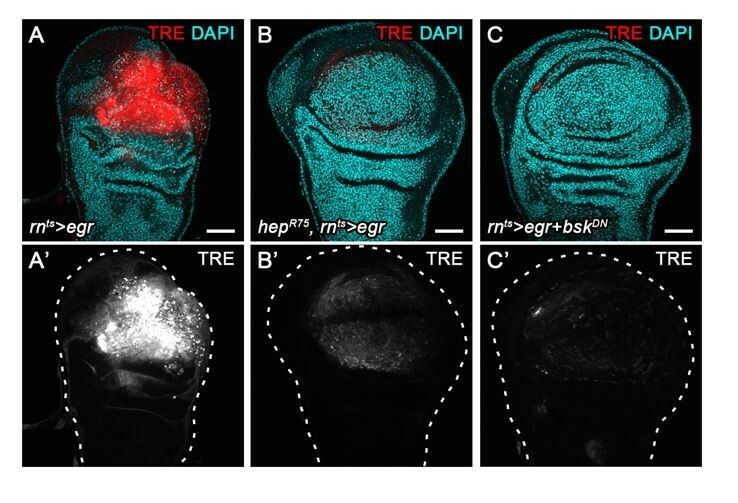 JNK signaling in the wing peripodium is required for wing eversion at the larval-pupal transition (Pastor-Pareja et al., 2004). (D–E’) The peripodium of size-matched wild type (D,D’) and hepR75 hemizygous mutant discs (E,E’) stained for Ubx (gray in D,E, outlined in cyan) and expressing both FUCCI reporters (D’,E’). (F–G) Quantifications of the total number of Ubx-positive cells (F) and of the Ubx-positive cells in G2 (G) in wild type and hepR75 hemizygous mutant discs. Graphs display mean ± SEM for wt, n = 9 and hepR75, n = 9 discs. U-tests were performed to test for statistical significance, n.s. = non significant, **p=0.011. Maximum projections of multiple peripodial confocal sections are shown in C-E’. Scale bars: 50 µm. To test if G2 stalling was a general response to JNK activation, we investigated if developmentally patterned JNK activity was associated with cell cycle changes. JNK in the wing peripodium is required for disc eversion (Pastor-Pareja et al., 2004). Strikingly, TRE activity in the peripodium correlated with a G2 profile and absence of DNA replication (Figure 3C, C', Figure 3—figure supplement 1A,A'). To test if JNK was necessary for this developmentally regulated G2 profile, we suppressed JNKK activity in the entire larva by hemizygosity for hepR75, a pupal lethal allele of hep (Glise et al., 1995). Indeed, the peripodium of size-matched hepR75 discs displayed a significant reduction in the number of G2 cells and an increase in G1-phase cells, if compared to wild type discs (Figure 3D-G, Figure 3—figure supplement 1B-E). Combined, these observations indicate that JNK is at least partially necessary for one example of developmentally regulated G2-stalling in the absence of tissue damage. 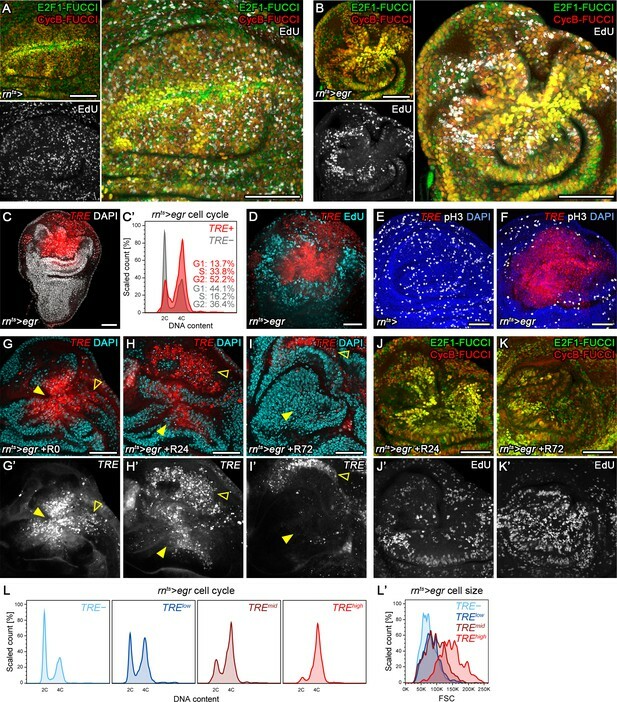 The observation that JNKK was required for developmentally patterned G2 stalling suggested that JNK itself rather than tissue damage per se induces these cell cycle changes. In agreement with this hypothesis, we observed no correlation between the occurrence of ɣH2Av, a marker of dsDNA breaks (Khurana and Oberdoerffer, 2015), and G2-stalling in egr-expressing discs (Figure 3—figure supplement 2A-A''). Moreover, neither knock-down of the DNA damage sensing and relay components chk1 (grp), ATR (mei-41), nor organismal hemizygosity for mei-41RT1 prevented the appearance of a G2-dominated FUCCI profile in egr-expressing discs (Figure 3—figure supplement 2B-D). We conclude that DNA damage per se, normally a potent inducer of G2/M arrests (Sancar et al., 2004; Song, 2005), is not a rate-limiting driver of G2-stalling. Yet, DNA damage or damage of other cellular components could contribute to G2-stalling via activation of JNK. Importantly, however, activation of JNK could integrate both damage and developmental signals with cell cycle control. We next aimed to understand which cell cycle regulator may be targeted by JNK to promote G2-stalling. Knock-down of Cdk1 in the wing pouch induced a dramatic shift of the FUCCI profile, resembling the shift observed in egr-expressing discs (Figure 4—figure supplement 1A,B). This suggests that a lack of Cdk1 activity may arrest JNK-signaling cells. A rate limiting activator of Cdk1 during the G2/M transition is the Cdc25-type phosphatase String (Stg) (Edgar et al., 2001; Kimelman, 2014; Kiyokawa and Ray, 2008), whose proteasomal degradation is regulated by Tribbles (Trbl) (Mata et al., 2000; Seher and Leptin, 2000). We first analyzed a GFP trap inserted in the stg locus (Buszczak et al., 2007). Of note, the stg-GFP chromosome is lethal and GFP expression fails to track with cell cycle phase in individual cells (Figure 4—figure supplement 1E-E''), suggesting that the trap disrupts stg function and does not give rise to a Stg-GFP fusion protein that is faithfully degraded during the cell cycle. However, expression of GFP from the locus reflects previously published tissue-level expression patterns of stg transcripts (Figure 4—figure supplement 1F-G''') (Johnston and Edgar, 1998; Thomas et al., 1994), indicating that the trap behaves as a reporter of stg transcription. We observed that expression of the stg-GFP trap was dramatically downregulated in G2-shifted cells of egr-expressing discs (Figure 4A-B') suggesting that stg transcription was reduced. A GFP-tagged Tribbles protein (Nagarkar-Jaiswal et al., 2015; Otsuki and Brand, 2018) was highly upregulated in egr-expressing and surgically injured discs (Figure 4C-E) in a manner that was dependent on JNK activity (Figure 4E). Thus, JNK-activity seperately impinges on stg transcription and Trbl availability, potentially underlying stalling of cells in G2 in parallel pathways. Cdc25/String and Tribbles regulate G2 stalling. (A–B’) Control wing disc (A,A’) and egr-expressing disc at 0 hr into the recovery period (B,B’) expressing a GFP trap element in the stg locus (A’,B’, cyan in A,B) and the G2-specific FUCCI reporter mRFP-NLS-CycB1-266 (red in A,B). Note pronounced reduction of GFP expression in G2-arrested cells at the center of the pouch (B,B’). (C–E) Control wing disc (C), an egr-expressing disc at 0 hr into the recovery period (D), and a surgically damaged wing disc 6 hr into the recovery period expressing bskDN in the posterior compartment (on the right-hand side of the dotted line) under control of enGAL4 (E). All discs also express a GFP-tagged Trbl protein expressed from the native locus (Nagarkar-Jaiswal et al., 2015). Arrows indicate axis of surgical injury verified by tissue deformation in basal sections. (F–H) An egr-expressing disc (F), an egr,stg-co-expressing disc (G) and an egr,trbl RNAi-co-expressing disc at 0 hr into the recovery period expressing the FUCCI reporters. Note increase in the frequency of G1 cells in (G,H). (I–J’) An egr-expressing disc (I,I’) and an egr,stg-co-expressing disc (J,J’) analyzed by EdU incorporation to reveal DNA replication activity (green in I,J) and by staining for phospho-Histone3 to reveal mitotic cells (pH3) (green in I’,J’). Discs were counterstained with DAPI (magenta). Note increase in the frequency of S- and M-phase cells upon egr,stg co-expression. Maximum projections of multiple confocal sections are shown in F-H. Scale bars: 50 µm. We thus wanted to test, if targeted overexpression of stg or knockdown of trbl can suppress JNK-induced G2-stalling. While stg overexpression and trbl RNAi-mediated knockdown in the wild type disc reduces developmental G2-patterns at the dorsal-ventral compartment boundary (Figure 4—figure supplement 1C,D), we and previous studies (Mata et al., 2000; Neufeld et al., 1998; Reis and Edgar, 2004) failed to detect pronounced alterations in proliferation patterns (Figure 4—figure supplement 1H-I") or adult wings (Figure 4—figure supplement 1J-L), suggesting that overexpression of stg or knockdown of trbl causes little changes to wing development. Importantly, overexpression of stg and or knockdown of trbl in egr-expressing cells re-established a heterogeneous FUCCI cell cycle profile (Figure 4F-H). Specifically, cycling cells in egr,stg-coexpressing domains could be detected by EdU incorporation and pH3 labeling (Figure 4I-J'). Combined, these observations suggest that trbl and stg are rate limiting for cell cycle progression in JNK-signaling cells and that overexpression of stg or knockdown of trbl is sufficient to override damage-induced cell cycle stalling in G2. Having identified two potent suppressors of G2-stalling, we asked what role stalling may have in tissue stress responses. We focus in the following experiments on stg, as a more direct cell cycle effector. egr-expressing discs normally present with a folded architecture (Figure 5A,B) and large G2-arrested cells at the center of the pouch (Figure 2A,B). In contrast, egr,stg-co-expressing discs presented with densely and regularly arranged columnar cells (Figure 5A-C'). Moreover, stg co-expression improved tissue regeneration in egr-expressing discs, as assessed by size and morphology of adult wings. 59% of adult wings developing from egr,stg-co-expressing discs were of wild type size, in contrast to just 14% of wings developing from egr-expressing discs (Figure 5E, Figure 5—figure supplement 1A,B). Importantly, stg expression did not interfere with activation of apoptosis (Figure 5—figure supplement 1D-G) or JNK activation (Figure 5—figure supplement 1H) in response to egr expression. Instead, the egr,stg-expressing cell population labelled by G-TRACE (Evans et al., 2009) was larger in size (Figure 5F-H). This suggests that stg overexpression did not interfere with cell ablation but specifically with arrest of the cell cycle and thus proliferative capacity in egr-expressing cells. egr-expressing discs had been previously reported to exhibit low regenerative potential, in contrast to discs expressing the pro-apoptotic gene hid (Herrera et al., 2013), an antagonist of Diap1-dependent inhibition of caspase activity (Vaux and Silke, 2005). 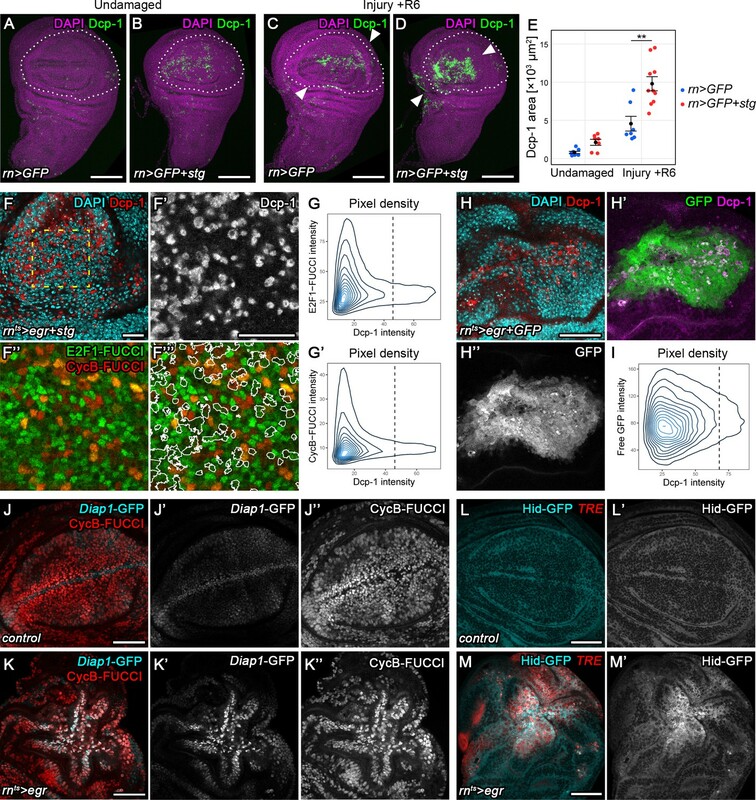 Strikingly, preventing a G2-arrest in egr-expressing discs by stg overexpression phenocopied hid-induced regeneration, where discs display columnar morphology (Figure 5D,D') and regenerate efficiently to normal-sized adult wings (Figure 5E, Figure 5—figure supplement 1C). Importantly, hid-expressing discs activated the TRE-reporter only at low levels and forwent the pronounced changes to FUCCI reporter activity observed in egr-expressing discs (Figure 5I-L). These observations indicate that persistent stalling and arrest of cells in G2 interferes with regeneration in egr-expressing discs by interfering with the ability of cells to divide and proliferate. Moreover, they highlight G2-stalling as dose-sensitive JNK-effector which determines the regenerative potential of different experimental regeneration models. Of note, egr-expression also induced TRE-reporter activity at much higher levels (Figure 7B,B’,D,D’) and at longer timescales than surgical injury (Figure 5M,N), supporting our conclusion that egr-expressing discs may experience extreme and possibly aberrant G2 stalling and arrest. Chronic stalling in G2 interferes with proliferative capacity. (A–D’) X-Y view of a control wing disc (A), an egr-expressing (B), egr,stg-co-expressing (C) or hid-expressing disc (D) at 0 hr into the recovery period. Cross-sections through the tissue (A’–D’) were visualized along dotted yellow lines. Discs were stained for Discs large 1 (Dlg1, A-D, green in A’-D’) and E-cadherin (Ecad, magenta in A’-D’) to visualize cell outlines and cell polarity. (E) Adult wings developing from egr-expressing, egr,stg-co-expressing or hid-expressing discs were classified according to wing size and morphology (see Materials and methods, Figure 5—figure supplement 1A-C). Graphs display mean ± SEM of ≥3 independent experiments. Note the significantly improved wing regeneration of rnts>egr+stg (p<0.0001, n = 676 wings) and rnts>hid (p<0.0001, n = 514 wings) when compared to rnts>egr (n = 718 wings) by chi-squared tests. (F–H) Control wing disc (F), an egr-expressing (G) and egr,stg-co-expressing (H) disc at 0 hr into the recovery period where the surviving rnGAL4-lineage has been labeled by G-TRACE (green) (Evans et al., 2009). Discs were counterstained with DAPI (magenta). (I–K’) Control wing disc (I), an egr-expressing (J) or hid-expressing (K) disc at 0 hr into the recovery period. Discs express the JNK-reporter TRE-RFP (I’-K’, red in I-K) and were counterstained with DAPI (cyan in I-K). 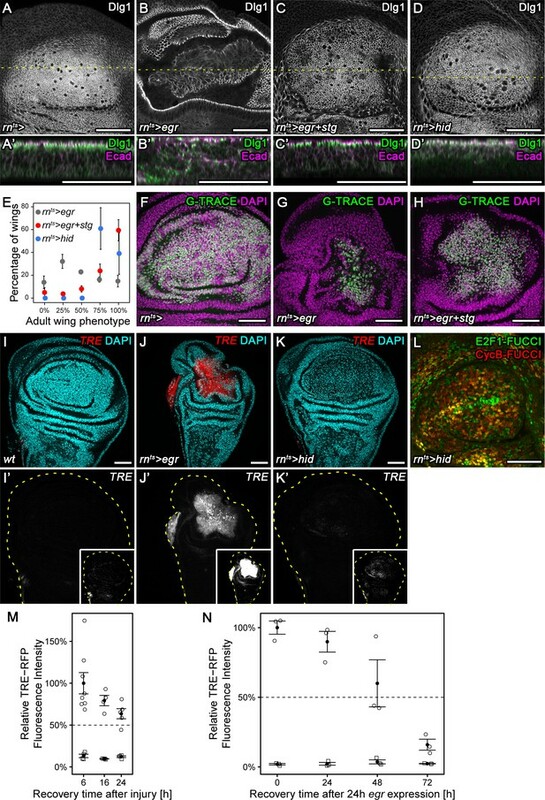 TRE-reporter activity was imaged at settings optimized to subsaturation in egr-expressing discs. Small insets in (I’–K’) show the same images adjusted to the dynamic range in hid-expressing discs. Note that distinct DAPI dense particles seen in the pouch of hid-expressing discs represent remnants of apoptotic cells. (L) A hid-expressing disc at 0 hr into the recovery period expressing FUCCI reporters (compare to Figure 2B). (M,N) Quantifications of TRE-RFP fluorescence intensity at the wound site in surgically injured wing discs at 6 hr, 16 hr, and 24 hr after tissue damage (M, circles) and in egr-expressing discs at 0 hr, 24 hr, 48 hr and 72 hr into the recovery period (N, circles). Larvae with surgically injured wing discs pupariate at 24 hr so later time points could not be quantified. Note that TRE-RFP reporter activity declines faster in surgically injured discs. Fluorescence intensity in non-wound regions (squares) serves as baseline reference. Graphs display mean ± SEM for n = 8 (6 h), n = 4 (16 h), n = 5 (24 h) injured discs (M) or n = 3 (0 h), n = 3 (24 h), n = 3 (48 h), n = 3 (72 h) egr-expressing discs (N). Maximum projections of multiple confocal sections are shown in A-D, F-H. Scale bars: 50 µm. Our observation that G2-stalled cells reenter the cell cycle when JNK-signaling decreases suggests that G2-stalled cells can survive in high, potentially pro-apoptotic JNK-signaling environments. We therefore asked if G2-stalled cells are resistant to apoptosis. We thus suppressed G2-stalling in surgically injured discs by expressing stg using rnGAL4. Strikingly, 6 hr after injury, we observed a 2-fold increase in the apoptotic domain within injured discs (Figure 6A-E). Importantly, while stg overexpression also induced apoptosis primarily at the anterior D/V boundary in undamaged control discs, apoptosis in surgically injured discs was specifically increased near the wound site where JNK reporters are expected to be activated (Figure 6B,D). 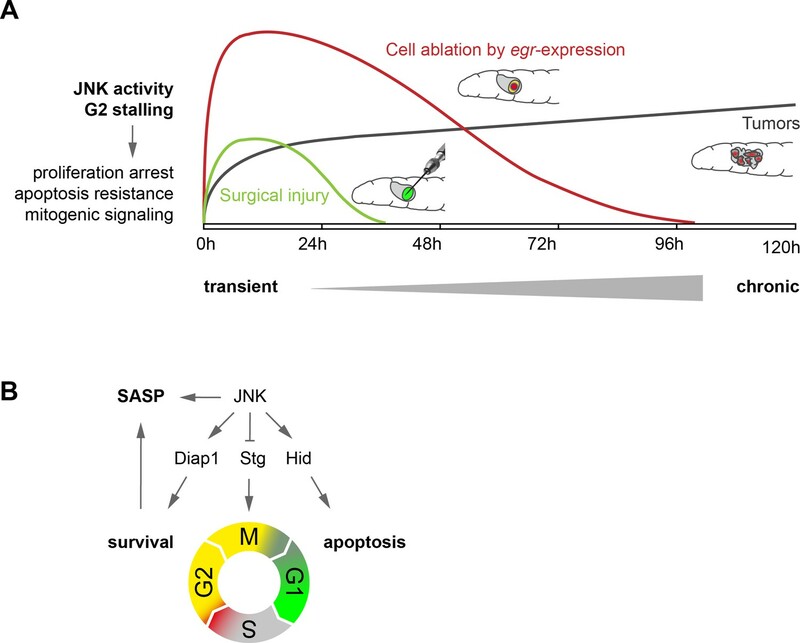 This suggests that at transient time scales, G2-stalling is required to prevent apoptosis and thus promotes survival in injured tissues displaying potentially lethal levels of JNK activity. Transient stalling in G2 promotes survival by protecting cells from JNK-induced apoptosis. (A–E) Undamaged control (A) and an undamaged disc expressing stg under the control of rnGAL4 (B). An injured control disc (C) and an injured stg-expressing disc (D), 6 hr into the recovery period. Dotted lines indicate the rnGAL4 domain, arrows indicate injury axis. Wing discs were stained for the apoptotic marker Dcp-1 (green) and counterstained with DAPI (magenta). The area occupied by Dcp-1 in a maximum projection is quantified in (E). Graphs display mean ± SEM for undamaged rn>GFP, n = 8; undamaged rn>GFP+stg, n = 7; injured rn>GFP, n = 7; injured rn>GFP+stg, n = 10 discs. U-tests were performed to test for statistical significance, **p<0.01. (F–F’’’) An egr,stg-expressing disc analyzed for FUCCI activity (F’’,F’’’) and the apoptotic marker Dcp-1 (F’, red in F) or DAPI (cyan in F) at 0 hr into the recovery period. F’-F’’’ represent the area framed by broken line in F. White lines in F’’’ represent the Dcp-1 outline mask of F’. Note that masked cells generally express low levels of either FUCCI reporter. (G–G’) The fluorescence intensities of Dcp-1 and the GFP-E2f11-230 (G) or mRFP-NLS-CycB1-266 (G’) FUCCI reporters for each pixel are plotted as 2D density graphs (see Materials and methods). The broken line represents a visually chosen Dcp-1 threshold defining apoptotic cells. Note that the surviving population expresses the entire range of FUCCI reporter intensities (left), in contrast to apoptotic cells (right). (H–I) An egr,GFP-expressing disc stained for the apoptotic marker Dcp-1 (red in H, magenta in H’) and DAPI (cyan in H) at 0 hr into the recovery period. Graph (I) plots the 2D density of pixel fluorescence intensities for Dcp-1 and free GFP. The broken line represents a visually chosen Dcp-1 threshold defining apoptotic cells. Note that the surviving and apoptotic population use the GFP fluorescence spectrum symmetrically. (J–K’’) Control (J–J’’) and an egr-expressing (K–K’’) disc at 0 hr into the recovery period expressing the Diap1-GFP.3.5 reporter (J’,K’, cyan in J,K) and the G2-specific FUCCI reporter mRFP-NLS-CycB1-266 (J’’,K’’, red in J,K). Note the anti-correlation between Diap1 promoter activity and G2-phase in control discs, in contrast to egr-expressing discs. (L–M’) Control (L,L’) and egr-expressing (M,M’) discs at 0 hr into the recovery period expressing a Hid-GFP fusion protein under endogenous control (L’,M’, cyan in L,M). JNK-signaling cells were detected by activation of TRE-RFP (red in L,M). Maximum projections of multiple confocal sections are shown in A-D. Scale bars: 100 µm (A–D), 20 µm (F,F’’’), 50 µm (H–M). If stalling in G2 protects cells from apoptosis, are JNK-signaling cells more susceptible to apoptosis in other phases of the cell cycle? To test this idea, we first confirmed that actively cycling, JNK-signaling cells did not die in late G2 by demonstrating that Dcp-1 levels were highest in egr-expressing cells with low levels of a co-expressed HA-tagged stg (Figure 6—figure supplement 1A-A'"). Stg-HA peaked in late G2 and mitotic cells but was absent in G1, S-phase and early G2 (Figure 6—figure supplement 1B-B''). To further narrow down the cell cycle phase at which JNK signaling cells died, we correlated levels of the apoptotic marker Dcp-1 with FUCCI reporter activity in egr,stg-co-expressing discs. We took care to specifically analyze confocal sections within the tissue to catch apoptotic cells before extrusion. We found that in actively cycling, JNK-signaling tissue, Dcp-1 could be specifically detected in cells with low intensity of either FUCCI reporter (Figure 6F-G'), suggesting that JNK-signaling cells preferentially died either early in G1 or late in S-phase. Importantly, low FUCCI reporter fluorescence was not due to apoptosis-dependent degradation of fluorophores, as levels of fluorescence intensity of an unrelated cytoplasmic GFP were independent of Dcp-1 levels in egr,GFP-co-expressing discs (Figure 6H-I). Additionally, the overall FUCCI profile of egr,stg and stg-expressing control discs was similar, confirming that FUCCI reporter intensities were not affected by apoptotic cells per se (Figure 6—figure supplement 1C-C"). To better understand when cycling JNK-signaling cells died, we allowed discs to incorporate EdU for at least 1 hr prior to fixation. We consistently failed to detect recent DNA replication in apoptotic cells (Figure 6—figure supplement 1E-E") indicating that cells did not die in S-phase. Taken together, these results support a model where JNK-signaling cells are susceptible to apoptosis in G1 and protected from apoptosis by stalling in G2. To understand how G2-stalled cells may be protected from apoptosis, we analyzed expression of Diap1, an inhibitor of the initiator caspases, as well as of hid, a potent IAP antagonist (Vasudevan and Ryoo, 2015; Vaux and Silke, 2005). A Diap1-GFP reporter encompassing enhancer elements sensitive to regulation by anti-apoptotic Hippo/Yorkie signaling (Zhang et al., 2008) was upregulated in TRE-positive (data not shown) and G2-stalled cells at the center of egr-expressing discs (Figure 6J-K"). Importantly, Diap1-GFP activity did not correlate with tissue patterns of G2 in undamaged control discs (Figure 6J,J"), suggesting that Yorkie activity at Diap1 regulatory elements was not controlled in a cell cycle-dependent manner per se, but likely reflected activation of Yorkie by JNK (Sun and Irvine, 2011; Ríos-Barrera and Riesgo-Escovar, 2013). A Hid-GFP fusion protein expressed under the control of endogenous regulatory elements (Nagarkar-Jaiswal et al., 2015) was also strongly upregulated in TRE-positive cells in egr-expressing discs (Figure 6L-M'). These observations align with previous reports of activation of anti-apoptotic Yorkie (Sun and Irvine, 2011; Ríos-Barrera and Riesgo-Escovar, 2013) or pro-apoptotic Hid (Luo et al., 2007; Shlevkov and Morata, 2012) by JNK in stressed cells. We highlight that the activation of anti-apoptotic and pro-apoptotic pathways occurs concomitantly in JNK-signaling G2-stalled cells. Taken together, these results suggest that transition from G2 to G1 represents the key switch in the cellular interpretation of opposing JNK-dependent signals with anti-apoptotic to pro-apoptotic consequences. Cell cycle arrest and apoptosis resistance are hallmarks of senescence. Senescent cells affect their microenvironment through senescence-associated secretory phenotype (SASP) (Hernandez-Segura et al., 2018; Neves et al., 2015; Pluquet et al., 2015; Salama et al., 2014), which promotes tumorigenesis and contributes to tumor heterogeneity (Hinds and Pietruska, 2017; Schosserer et al., 2017). Many studies report heterogenous activation of JNK in imaginal discs upon genetic loss of tumor suppressor function (Richardson and Portela, 2018). We thus tested if imaginal disc tumor models displayed any evidence of a JNK-induced G2-shift. We first analyzed warts (wtsx1) mosaic clones (Xu et al., 1995) which promote Yorkie activity, in wing imaginal discs also expressing TRE-RFP (Figure 7A). Localized TRE-RFP expression increased in mosaic discs during larval stages (Figure 7—figure supplement 1A). Based on flow cytometry analysis, we estimated that 40.6% of wtsx1 cells had at least elevated TRE-RFP reporter activity. 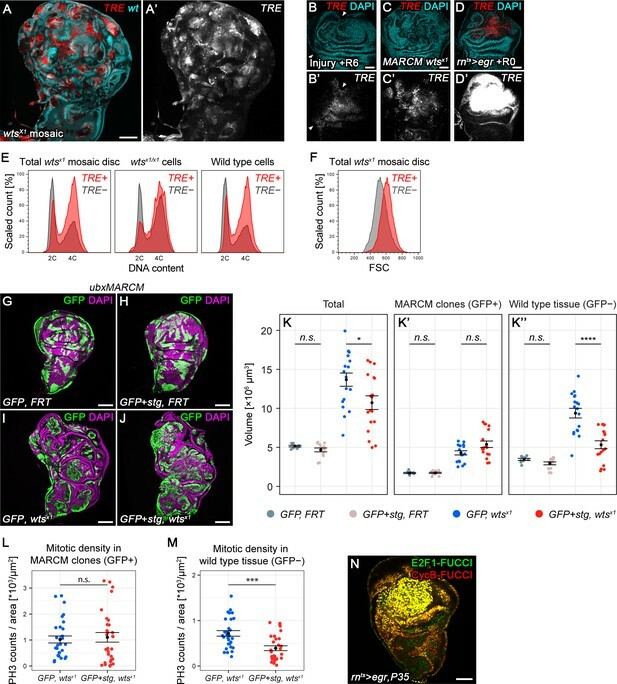 Consistent with non-autonomous induction of JNK in response to tissue stress (Bosch et al., 2005; Herrera et al., 2013; Wu et al., 2010) 29.9% of wild type cells displayed TRE-RFP reporter activity. Importantly, TRE-RFP levels were comparable to levels induced by surgical injury but much lower than those induced by egr-expression (Figure 7B-D'). Flow cytometry analysis revealed that TRE-positive cells exhibited a strong G2 profile which correlated with an increase in cell size (Figure 7E,F). This effect was observed in TRE-positive wtsx1 and wild type cells (Figure 7E). This relationship could also be observed in mosaic discs containing clones mutant for scribdt12, a hypomorphic tumor suppressor mutation in the key component of the Scrib/Lgl/Dlg epithelial polarity module (Figure 7—figure supplement 1B-D) (Stephens et al., 2018; Zeitler et al., 2004). Combined, these observations suggest that a pronounced shift towards G2 is associated with JNK activity in response to tissue stress imposed by the presence of abnormal or tumorigenic cells. Chronic stalling in G2 promotes non-autonomous overgrowth. (A,A’) A wing disc expressing TRE-RFP and carrying mosaic wtsx1/x1 clones marked by the absence of GFP (cyan in A). (B–D’) A surgically damaged wing disc 6 hr into the recovery period (B,B’), a wing disc carrying wtsx1/x1 MARCM clones (C,C’) and an egr-expressing disc at 0 hr into the recovery period (D,D’). Discs express the JNK-reporter TRE-RFP (B’-D’, red in B-D) and were counterstained with DAPI (cyan in B-D). TRE-reporter activity was imaged at settings optimized to subsaturation in egr-expressing discs. Panels (B’–D’) show the TRE-RFP fluorescence adjusted to the dynamic range of surgically injured discs. (E–F) Mosaic wtsx1/x1 wing discs were analyzed for DNA content (E) and cell size (F) by flow cytometry. The total cell population of discs was plotted as TRE-positive or TRE-negative events (E,F). The same analysis was also applied separately to wtsx1/x1 cells and wild type cells sub-populations (E only). Of note, previous cell cycle studies of Hippo-pathway mutant have not reported any alterations (Harvey et al., 2003; Huang et al., 2005; Tapon et al., 2002). Therefore, the mild cell cycle shift in TRE-negative wtsx1/x1 cells appears to be specific to the wtsx1 allele. (G–J) Wing imaginal discs carrying GFP-labeled MARCM clones (green) that are either wild type (G), stg-overexpressing (H), mutant for wtsx1 (I) or stg-overexpressing and mutant for wtsx1 (J). Discs were counterstained with DAPI (magenta). (K–K’’) Volumes occupied by the total disc (K), the GFP-labeled fraction representing MARCM clones (K’) and the non-GFP-labeled fraction representing the surrounding wild type tissue (K’’). Graphs display mean ± SEM for tub>GFP, FRT, n = 9; tub>GFP+stg, FRT, n = 13; tub>GFP, FRT wtsx1, n = 18; tub>GFP+stg, FRT wtsx1, n = 18 discs. U-tests were performed to test for statistical significance (n.s. not significant, *p<0.05, ****p<0.0001). (L,M) Quantification of phospho-Histone3 events identifying mitotic cells, normalized to the relevant tissue area. Mitotic cells were counted in GFP-positive MARCM clones that are either mutant for wtsx1 (blue) or mutant for wtsx1 and overexpressing stg (red) (L), and in the non-GFP-labeled fraction representing the wild type tissue surrounding clones mutant for wtsx1 (blue) or mutant for wtsx1 and overexpressing stg (red) (M). Graphs display mean ± SEM, n = 30 confocal sections from six discs per sample. U-tests were performed to test for statistical significance (n.s. not significant, ***p<0.001). (N) An egr,p35-co-expressing disc at 0 hr into the recovery period expressing both FUCCI reporters. Scale bars: 50 µm (B–D,N), 100 µm (A, G–J). To understand if G2-stalling played a role in tumor growth or tumor microenvironment, we overexpressed stg in wtsx1 or dlg1G0342 clones. Like scrib, dlg1 is a tumor suppressor in the Scrib/Lgl/Dlg epithelial polarity module (Stephens et al., 2018) and mutant cells activate JNK (Igaki, 2009; Igaki et al., 2009). Overexpression of stg in mosaic wtsx1 or dlg1G0342 clones did not significantly increase clone size (Figure 7G-K", Figure 7—figure supplement 1E-I’’). As division rates of cycling cells are not expected to be enhanced by stg overexpression alone (Neufeld et al., 1998), promoting cycling of a small fraction of arrested tumor cells may not significantly increase tumor mass. Strikingly, however, when we further analyzed these mosaic discs, we found that stg overexpression in wtsx1 and in dlg1G0342 cells strongly affected the surrounding wild type tissue. The absolute size of the wild type tissue in mosaic wtsx1 or dlg1G0342 mutant discs is almost double of that in mosaic wild type control discs (Figure 7K", Figure 7—figure supplement 1I’’), a phenomenon ascribed to non-autonomous overgrowth stimulated by the chronic presence of tumorigenic cells (Fuchs and Steller, 2015; Pastor-Pareja and Xu, 2013; Uhlirova et al., 2005). However, stg overexpression strongly reduced the size of the surrounding wild type tissue in mosaic wtsx1 and dlg1G0342 discs (Figure 7K", Figure 7—figure supplement 1I’’). Importantly, whereas mitotic activity in wtsx1 clones was unaffected (Figure 7L), stg-overexpression strongly reduced mitotic activity in the wild type tissue surrounding wtsx1 clones (Figure 7M). This strongly suggests that stalling of JNK-signaling cells in G2 directly promotes non-autonomous proliferation and thus causes non-autonomous overgrowth on prolonged timescales during imaginal disc tumor development. Previous studies describe ‘undead’ cells as chronic drivers of non-autonomous overgrowth. Experimentally, undead cells are created by expression the anti-apoptotic factor p35 in apoptotic JNK-signaling cells (Chen, 2012; Fuchs and Steller, 2015; Martín et al., 2009; Pérez-Garijo et al., 2009; Shlevkov and Morata, 2012; Wells et al., 2006). We created undead cells by co-expressing p35 in egr-expressing disc. Egr,p35-coexpressing cells completely arrest in G2 (Figure 7N), confirming that G2-stalling is intimately associated with cellular states known to stimulate non-autonomous growth. Genetically, the initiator caspase Dronc is required to stimulate non-autonomous growth from dying and undead cells (Enomoto et al., 2015; Fan and Bergmann, 2008a; Fan and Bergmann, 2008b; Kiyokawa and Ray, 2008; Kondo et al., 2006; Wells et al., 2006). To demonstrate that caspases are activated in G2 stalled cells and that G2 stalling may confer resistance to the execution of apoptosis, we analyzed the CasExpress sensor in surgically injured discs. CasExpress permanently labels anastatic cells, which have survived caspase activation (Ding et al., 2016; Tang et al., 2012). Strikingly, 24 hr after surgical injury, we observed many CasExpress-positive clones near the wound site (Figure 7—figure supplement 2A,B). This indicates that many wound-proximal cells survive caspase activation and subsequently proliferate. While we cannot demonstrate that these anastatic cells corresponded to G2-stalled cells, we suggest that G2 stalling could facilitate transient mitogenic signaling of Dronc-positive, JNK-activated cells at wound sites. We wanted to understand if G2-arrested cells may affect their microenvironment not just via induction of mitogenic signaling, but also through upregulation of additional SASP-like markers. We tested reporters for ECM degrading enzymes (MMP1), ROS response (GstD-GFP) and UPR (Xbp1-GFP), in addition to reporters for mitogenic signaling (upd-LacZ), for activation in egr-expressing discs. As expected from many studies previously linking upregulation of these markers to JNK (Bunker et al., 2015; Fulda et al., 2010; Richardson and Portela, 2018; Santabárbara-Ruiz et al., 2015; Takino et al., 2014; Uhlirova and Bohmann, 2006), we found all SASP-like markers, including cell size (Figure 2—figure supplement 1D), to be highly elevated (Figure 7—figure supplement 2C-J). The co-occurrence of G2-arrest, JNK activity and SASP-like markers suggests that a JNK-signaling induced G2-arrest in flies is linked to senescence-like phenotypes driven by JNK. Importantly, transient upd-LacZ and MMP1 upregulation is associated with transient JNK activity in surgical injuries (Lin et al., 2010; McClure et al., 2008), making it plausible that transient G2-stalling is linked to senescence-like properties promoting wound healing and regeneration, analogous to senescent cells observed in a mammalian wound model (Demaria et al., 2014). Here we uncover a mechanism whereby control of the cell cycle promotes survival and mitogenic signaling in JNK-dependent responses to tissue stress. We demonstrate that JNK signaling induces a dose-dependent extension of G2, which results in either transient stalling or prolonged arrest of cells in G2. Cells in G2 are protected from undergoing JNK-induced apoptosis and promote proliferative signaling to the surrounding tissue in a SASP-like manner (Figure 8). (A) Transient (surgical injury), prolonged (egr-expression) and chronic (mosaic tumors) disruption of tissue homeostasis induces transient, prolonged and chronic JNK activity, thereby driving G2-stalling and senescence-like properties in a dose- and time-dependent manner. (B) JNK regulates SASP, Diap1, Stg and Hid. The transition between G2 and G1 acts as switch that prevents survival and SASP. The decision to arrest in G2 is JNK-dependent, which can integrate information about damage and has cell-protective functions. The decision to die in G1 may depend on additional information about the extent of cell and tissue damage. At first sight, some results in our study appeared contradictory. Using stg-overexpression to force stalled cells to cycle, we observed (1) apoptosis of JNK-signaling cells in surgically damaged discs, (2) improvement of regenerative capacity in egr-expressing discs and (3) reduction of non-autonomous overgrowth in a mosaic tumor model. Our data support a model where any length of G2-stalling protects cells autonomously from JNK-induced apoptosis in G1. Stalled cells switch on a SASP-like phenotype, which when transient supports compensatory growth during regeneration. However, when cells stall chronically, proliferation is autonomously inhibited and chronic SASP-like phenotype drives non-autonomous overgrowth contributing to tumorigenesis. We suggest that our experimental models reveal a spectrum of cell-autonomous (survival, stalling of proliferation) and non-autonomous (mitogenic paracrine signaling) functions of G2-stalling. 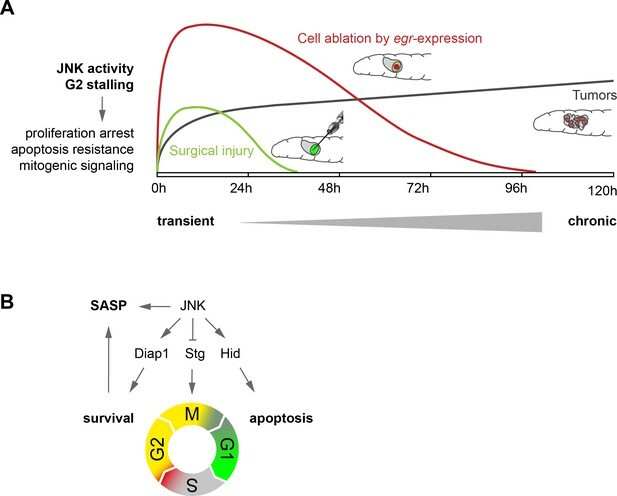 Importantly, this spectrum is defined by the intensity and length of JNK activity: whereas persistent stalling of tumor cells may cause persistent survival and non-autonomous overgrowth, transient stalling of wound site cells may promote survival transiently and facilitate transient induction of compensatory proliferation. Surprisingly, both G2-stalling and survival as well as apoptosis directly link to JNK signaling in response to tissue stress. We find that JNK controls stg/cdc25 transcription and Trbl availability as rate-limiting factors for stalling. Importantly, mouse JNK directly phosphorylates Cdc25C to stall G2/M transitions (Goss et al., 2003; Gutierrez et al., 2010). If JNK also phosphorylates Stg in flies remains to be determined. As reported before, JNK also regulates hid promoting apoptosis (Shlevkov and Morata, 2012) and activates Hippo/Yorkie promoting survival by upregulation of Diap1 (Sun and Irvine, 2011; Sun and Irvine, 2013). This is analogous to mammalian models where tissue stress induces apoptosis but can also promote cell cycle arrest and survival through upregulation of cell-protective mechanisms. However, the switch between the anti- and pro-apoptotic consequences are not understood (Fulda et al., 2010). Importantly, our observations imply that cell cycle progression from G2 to G1 represents the switch between anti- and pro-apoptotic activity of JNK. We suggest that stalling the cell cycle is a protected state, which is dominated by pre-emptive protection from ROS damage through upregulation of the UPR, redox response and other repair pathways. Thus, G2-stalling is important to keep the pro-apoptotic branch of JNK signaling suppressed, a prerequisite of efficient regeneration (La Fortezza et al., 2016). We propose that G2-stalling is induced by JNK itself, and thus only indirectly by cellular damage. While we have not excluded that, for example, proteotoxic stress induces G2-stalling (Pluquet et al., 2015), we find that, similar to a previous report (Wells et al., 2006), DNA damage is not rate-limiting for cell cycle arrest. In support of this hypothesis, we find that stg overexpression rescues architecture and proliferation in egr-expressing discs. This indicates that, despite the fact that many JNK-signaling cells die in G1 when bypassing stalling in G2, there are many JNK-signaling G1 cells, which survive, continue to cycle and are healthy enough to contribute to future adult tissues. Even more strikingly, we find that independent of any tissue damage, developmentally regulated G2-stalling in the wing peripodium is dependent on JNK. Similarly, programmed cell arrest and senescence in mouse embryogenesis is independent of DNA damage or p53, but dependent on a general CDK-inhibitor (p21) and developmental signals of the TGF-β/SMAD or PI3K/FOXO pathways (Davaapil et al., 2017; Muñoz-Espín et al., 2013). Thus, cell cycle stalling and consequently, SASP or protection from apoptosis, may be under the control of signaling pathways which not always depend on tissue stress. Curiously, another developmentally regulated G2 arrest has already been reported to suppress apoptosis (Qi and Calvi, 2016). At least one previous study has indicated the existence of senescent cells in flies, however their cell cycle stage was less well-defined (Nakamura et al., 2014; Neves et al., 2015). Many studies have demonstrated correlation of JNK with SASP-like characteristics in flies, such as mitogenic signaling, ECM remodeling or ROS production (Brock et al., 2017; Khan et al., 2017; McClure et al., 2008; Nakamura et al., 2014; Neves et al., 2015; Pastor-Pareja and Xu, 2013; Ryoo et al., 2004; Uhlirova et al., 2005). We speculate that G2-stalling may either represent a primitive version of a senescent cell cycle arrest that evolved to G0 in mammalian cells or that G2-stalling may also occur in mammals but is less well-defined. Recent studies implicate a role for cells with senescent markers in mammalian wounds and vertebrate development (Davaapil et al., 2017; Demaria et al., 2014; Muñoz-Espín et al., 2013; Ritschka et al., 2017) and an injury-induced G2 arrest has been found to interfere with restoration of epithelial homeostasis in a model of chronic kidney disease (Bonventre, 2014). Future studies thus need to address if senescence markers can also be found in G2-arrested mammalian cells. G2-stalling may offer an opportunity to protect cells from apoptosis, induce paracrine signals and, importantly, restore active cycling upon restoration of tissue homeostasis, instead of engaging permanent senescence in G0. Thus, more studies are needed to address how G2-stalling may be related to G2 quiescence in stem cells (Otsuki and Brand, 2018), to a reversible G2 arrest (Gire and Dulic, 2015) or G0 senescence in mammalian tissues. Flies were kept on standard food and raised at 18°C and 30°C (expression of pro-apoptotic transgenes), or 25°C. A list of strains, detailed genotypes and experimental conditions are provided in Supplementary file 1 and in the key resources table. Wounding of wing imaginal discs in situ was performed by quickly immobilizing L3 larvae in ice-cold PBS and applying pressure to the fluorescently-labeled wing imaginal disc with a 0.125 mm tungsten needle (Fine Science Tools, 10130–05) without perforating the larval cuticle, as described by Bryant (1971); Yoo et al. (2016). After wounding, the larvae were immediately placed in a new food vial and allowed to recover at 25°C for the indicated time. For each animal, only the right wing disc was wounded. The left wing disc was used as undamaged control. For each experiment involving functional genetics, a wild type control was included, and the wounding procedure was performed in blind. At least 15 larvae were wounded for each genotype. To induce expression of egr or hid, experiments were carried out as described in Smith-Bolton et al. (2009) and La Fortezza et al. (2016) with few modifications. Briefly, larvae of genotype rnGAL4, tub-GAL80ts (denoted as rnts>) and carrying the desired UAS-transgenes were staged by a 6 hr egg collection and raised at 18°C at the density of 50 larvae/vial. Overexpression of transgenes was induced by shifting the temperature to 30°C for 24 hr at day seven after egg deposition (AED) (Figure 2—figure supplement 1A). Larvae were subsequently allowed to recover at 18°C for the indicated time (recovery time R24-R72 hours, or adulthood), or dissected immediately (R0). All images are R0, unless noted otherwise. Control genotypes were either rnts>, or the siblings of the ablating animals (+/TM6B, tubGAL80) (Smith-Bolton et al., 2009). At least 16 discs were dissected for each genotype per replicate. To obtain MARCM clones in the wing discs, larvae cultures were synchronized by a 6 hr egg collection and raised at 25°C at a density of 50 larvae/vial. Control larvae were analyzed 5 days AED, while larvae carrying wtsx1 clones were analyzed 7 days AED, to account for developmental delay induced by the presence of tumorigenic cells. To obtain MARCM clones in the eye discs, equal crosses for all genotypes were set up in parallel and processed 6 days AED. Discs expressing and stained for HA-tagged Stg were mounted on the same slide as their respective control discs, to ensure comparability of volume quantifications. Cell cycle analysis of wing imaginal discs by flow cytometry was performed as described (de la Cruz and Edgar, 2008). Wing imaginal discs from at least 10 larvae were dissected in PBS and incubated for 2 hr in PBS containing 9X Trypsin-EDTA (Sigma, T4174) and 0.5 µg/ml Hoechst 33342 (Invitrogen, H3570). Cells were analyzed with an LSRFortessa cell analyzer (BD Biosciences) or FACS Aria II cell sorter (BD Biosciences). Univariate cell cycle analysis was performed using the Watson Pragmatic algorithm in FlowJo v10 (FlowJo). Where possible, control and experimental samples were fixed, processed and mounted together to ensure comparable staining and imaging conditions. The signals of the following fluorescent reporters were further amplified by anti-GFP or anti-RFP antibody staining: CycB-FUCCI, E2F1-FUCCI, G-TRACE, Hid-GFP, stg-GFP, Trbl-GFP, Xbp1-GFP.HG. Larvae were dissected, and cuticles were fixed for 15 min at room temperature in 4% paraformaldehyde. Washing steps were performed in 0.1% Triton X-100/PBS (PBT), blocking in 5% NGS/PBT. The following antibodies were incubated overnight at 4°C: rabbit anti-cleaved Dcp-1 (Cell Signaling, 9578, 1:200), mouse anti-Cyclin B (DSHB, F2F4, 1:20), rat anti-DE-cadherin (DSHB, DCAD2, 1:100), mouse anti-discs large (DSHB, 4F3, 1:100), mouse anti-β-Galactosidase (Promega, Z3783, 1:1000), chicken anti-GFP (Abcam, ab13970, 1:1000), rabbit anti-GFP (Invitrogen, G10362, 1:200), rabbit anti-H2Av-pS137 (Rockland, 600-401-914, 1:500), mouse anti-H3-pS10 (Abcam, ab14955, 1:2000), rat anti-HA (MAB facility at the Helmholtz Zentrum München, 3F10, 1:20), mouse anti-MMP1 (DSHB, a mix of 3A6B4, 3B8D12 and 5H7B11, each 1:30), mouse anti-RFP (Abcam, ab65856, 1:100), rat anti-RFP (MAB facility at the Helmholtz Zentrum München, 5F8, 1:20), mouse anti-Ultrabithorax (DSHB, FP3.38, 1:10). EdU incorporation was performed for 15 min, unless noted otherwise, and detected using the Click-iT Plus EdU Alexa Fluor 647 Imaging Kit (Invitrogen, C10640) prior to primary antibody incubation, according to manufacturer’s guidelines. Tissues were counterstained with DAPI (0.25 ng/µl, Sigma, D9542) during incubation with cross-adsorbed secondary antibodies coupled to Alexa Fluorophores (Invitrogen or Abcam) at room temperature for 2 hr. Tissues were mounted using SlowFade Gold Antifade (Invitrogen, S36936). Samples were imaged using Leica TCS SP5 or SP8 confocal microscopes. Images were processed, analyzed and quantified using tools in Fiji (ImageJ v2.0.0) (Schindelin et al., 2012). Figure panels were assembled using Photoshop CS5 (Adobe). Statistical analyses were performed in R v3.3.3 (www.R-project.org). A mask of the DAPI counterstain, obtained from total projections of confocal stacks containing the entire wing discs, was used to estimate the total disc size by measuring its area with the ‘Analyze Particles’ tool in Fiji. To analyze a defined population of cells in the peripodium of size-matched wing discs, Ubx +nuclei were identified with ‘Analyze Particles’ (size = 10.00–40.00 circularity = 0.50–1.00), after applying ‘Unsharp Mask’ (radius = 10 mask=0.4), Gaussian Blur (sigma = 0.2 scaled) and Watershed functions. The nuclei of the resulting mask were counted and displayed as total Ubx +cells. Automated determination of the cell cycle phase for each nucleus was obtained by measuring the average fluorescence intensity of both FUCCI reporters. The criteria to define each cell cycle phase are shown in Figure 3—figure supplement 1E. To measure the fluorescence intensity of TRE-RFP signals in injured, egr-expressing or tumor discs, a small circular ROI of fixed radius (25–30 µm) was placed in an area of high TRE-RFP signal of a single confocal section for each stack, carefully chosen to capture maximal JNK activity in the disc proper, avoiding the peripodium and extruded cell debris. The mean intensity of each ROI was obtained using the ‘Measure’ function in Fiji. Masks of Dcp-1 signals were obtained in Fiji from maximum intensity projections of confocal stacks by applying a fixed threshold (value = 75) and the ‘Remove outliers’ function (bright, radius = 1.5). Areas of the resulting masks were obtained using ‘Analyze Particles’. A single confocal section for each stack was carefully chosen within the tissue to capture apoptotic cells before extrusion. An ROI corresponding to the pouch was selected using the ‘Freehand Selection’ tool in Fiji. Pixel fluorescence intensities for all channels were subsequently obtained using the ‘Save XY Coordinates’ function, after applying a ‘Gaussian Blur’ filter (radius = 0.3 µm) to reduce noise. Data from n = 5 (Figure 6G) and n = 4 discs (Figure 6I) were pooled and the distribution of fluorescence intensities of each pixel was represented as 2D density plots. 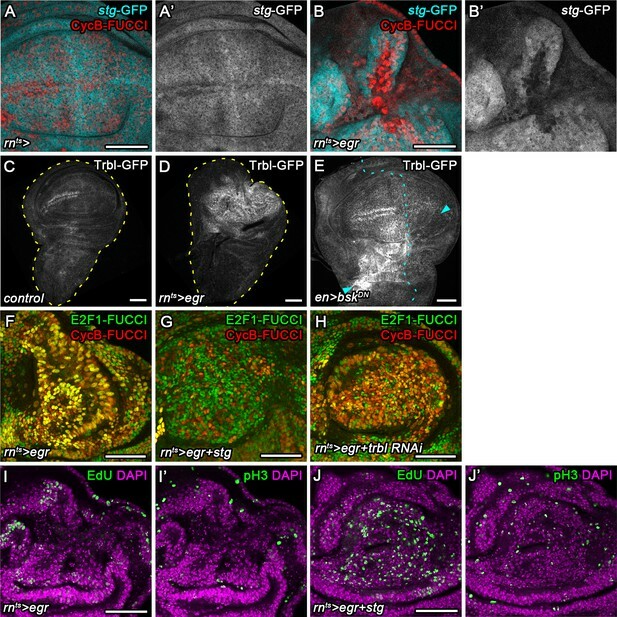 Masks for GFP signals (positively labeled clones) and total volume were obtained in Fiji from entire confocal stacks by applying the functions ‘Auto Threshold’ (settings: ‘Li’ for GFP or ‘Triangle’ for total, white objects, stack histogram) and ‘Remove Outliers’ (settings: black and white pixels removal, radii = 2) to GFP signals or to the sum of DAPI and GFP signals, respectively. The resulting masks were analyzed using the ‘3D Objects Counter’ function (settings: threshold = 128, min = 50 max=Inf). The sum of the resulting object volumes for each disc was used to describe the GFP and total volume of the disc. Non-GFP volumes were calculated by subtracting the GFP volume from the total disc volume. PH3-positive cells were counted in Fiji by applying ‘Auto threshold’ (settings: ‘Yen’) and ‘Remove Outliers’ (settings: black and white pixels removal, radii = 1) to single confocal sections. A total of 5 equally spaced (6 µm) confocal sections for each of 6 stacks per sample were analyzed. Masks for GFP signals were obtained by applying ‘Auto threshold’ (settings: ‘Triangle) and ‘Remove Outliers’ (settings: dark, radius = 3; bright, radius = 1). GFP-negative areas were calculated by subtracting GFP-positive areas from the total tissue area. Adult flies were collected 12 hr after eclosion and stored in 2-propanol. Wing sizes were indexed by binning into five different wing phenotypic classes: 0%, 25%, 50%, 75% or 100% of wild type size, as defined in La Fortezza et al. (2016); Smith-Bolton et al. (2009). Importantly, wings smaller than 100% of wild type size, typically present a range of morphological defects (Smith-Bolton et al., 2009). Of note, wings of 100% size but with notches or incomplete vein formation were classified as 75%. The International Journal of Developmental Biology 52:1043–1050. Nature Reviews Molecular Cell Biology 16:329–344. International Journal of Cell Biology 2010:1–23. The Journal of Biological Chemistry 285:14217–14228. Trends in Cell Biology 28:436–453. Anti-Cancer Agents in Medicinal Chemistry 8:832–836. Molecular and Cellular Biology 26:7258–7268. Disease Models & Mechanisms 8:1279–1293. Journal of Molecular Cell Biology 2:37–49. The International Journal of Developmental Biology 53:1341–1347. British Journal of Dermatology 173:370–378. The International Journal of Developmental Biology 49:391–399. Current Biology : CB 12:1263–1268. Annual Review of Genetics 47:51–74. American Journal of Physiology-Cell Physiology 308:C415–C425. Molecular Biology of the Cell 27:1885–1897. Annual Review of Biochemistry 73:39–85. Cell Death & Differentiation 19:451–460. Journal of Molecular Biology 430:3585–3612. Molecular Biology of the Cell 23:2240–2252. Current Topics in Developmental Biology 114:185–208. Nature Reviews Molecular Cell Biology 6:287–297. The Journal of Cell Biology 167:1137–1146. Thank you for submitting your article "JNK-dependent cell cycle stalling in G2 promotes survival and senescence-associated signaling in tissue stress" for consideration by eLife. Your article has been reviewed by three peer reviewers, and the evaluation has been overseen by Andrea Musacchio as the Senior and Reviewing Editor. The reviewers have opted to remain anonymous. The manuscript reports a study on the role of JNK signalling in different situations where this stress-related cascade is activated in Drosophila imaginal discs. JNK signalling is well known to be involved in disc tissue damage responses that contribute to apoptosis, regeneration and tumour formation. How JNK signalling can produce such different outcomes is a long-standing question. Studying different JNK signalling contexts in discs, the authors propose that JNK signalling induces transient arrest of cells in G2, which the authors call G2-stalling, under a variety of insults. This transient arrest in G2 protects cells from JNK-induced apoptosis and potentiates senescent-like phenotypes of these cells. G2 stalled cells may also be able to signal to neighbouring cells influencing also their behaviour. The reviewers agree that the study identifies G2 arrest as a critical aspect of the response of tissues to JNK signalling, and that this contributes to understanding tissue damage, regeneration and different outcomes of JNK signalling. The reviewers, however, also identify several points that require further attention. Please note that some of the points raised are closely related, but kept separate as they were raised by different reviewers. 1) The authors identify a possible mechanistic link between JNK signaling and G2 arrest in the upregulation of tribbles, a known negative regulator of G2-M transition. This seems really clear in Figure 4—figure supplement 1, showing striking tribbles upregulation in wounded discs. Why is this shown only in a supplementary figure? This is in my opinion one of the main findings in the paper, potentially taking it to a truly mechanistic level. Can the authors show induction of Tribbles is JNK-dependent? Can the authors show functional involvement of tribbles in JNK-induced G2 arrest? 2) Regarding the data showing G2 arrest in mosaic tumors (Figure 6), it seems very surprising the G2 shift in wts- clones, as previous analysis of other pathway mutants showed faster cycling but wt FACS cell cycle profiles, with no G2 shift (Tapon et al., 2002; Harvey et al., 2003). The authors state that the G2 shift is specific to TRE-positive (high JNK) cells, but the FACS profile in 6B' shows otherwise. It is important to make sure that this G2 shift is really a wts phenotype, and not, for instance, due to additional mutations in the FRT chromosome. For this, clones for other hippo mutants or yki-overexpression should be analysed. If real, the discrepancy with previous studies of Hippo/cell cycle should be acknowledged. If not real, these wts data could be removed to focus on the dlg- clones (Figure 7—figure supplement 1), showing the adult eyes are actually smaller when dlg- clones express string and that upd induction is reduced. 3) Regarding a normal role of JNK signaling promoting G2 arrest in the peripodial epithelium, this is again an important finding hidden in supplemental information, making this reviewer wonder how confident the authors are in their own data. To confirm JNK signaling is arresting cells in G2 in the peripodial epithelium: how did the authors define the peripodial epithelium to perform their counts? Is the peripodial epithelium in hepr75 (JNKK) discs larger? Does it show more EdU staining compared to S7F'? More PH3+ cells? 4) The finding that the proportion of cells in G2 correlates with JNK activity induced by injury, genetic cell ablation or loss of tumour suppressor genes is convincing. JNK activity is necessary and sufficient to induced G2 markers, which is convincingly supported by data. However, the authors may wish to consider the following points. Some concepts already established and linked to JNK need to be considered/discussed more clearly in the text. What about DNA damage response? Cdc25 phosphatase activity? Regulation or cell competition? 5) The idea of testing different JNK inducing conditions in terms of duration is very interesting and important. While it appears very likely that JNK signaling is different in these conditions, it would be important to show that. To that end, it might be desirable to provide TRE-reporter time-course for injury, egr RNAi and wts clones, showing that the TRE response curves are indeed different. Also, is it well established that the TRE reporter faithfully reports on JNK signaling dose in vivo, how is/was that shown? The scaling of TRE signal and G2 increase should be detectable by FACS. Further relevant here, is TRE signal affected in egr stg double RNAi pouches? It would be important to show that in the double RNAi TRE signal is still similar to egr RNAi alone. 6) The idea that JNK impinges on the cell cycle seems plausible. The study evokes Cdc25 downregulation through Tribbles upregulation as a potential mechanism as how JNK signalling could impinge on the cell cycle. Surprisingly there is no mentioning of literature that JNK can phosphorylate Cdc25 in HEK293 cells attenuating its phosphatase activity (e.g. Gutierrez et al., 2010), therefore there is a direct link on Cdc25 activity regulation, without the need to downregulate Cdc25. The GFP trap line for string is apparently not homozygous viable and hence not functional, so I am not convinced that the data show that stg levels actually decline in G2 stalled cells. 7) JNK is tightly linked to the G2/M DNA damage response checkpoint. Can it be ruled out that this checkpoint is triggered in the conditions used? Pushing cells through the cell cycle by Cdc25 overexpression can override DNA damage response checkpoints in certain systems. It would be important to test that injury, temporal egr RNA and wts do not activate the DNA damage response (DDR). There are some important experiments in Supplementary Figure 7 in the manuscript in this regard, buy they are oddly placed and discussed. Is the reported G2 stalling clearly distinguishable from G2 cell cycle arrest induced by DNA damage? 8) While the non-autonomous activation of TRE is clear and also previously reported, the situation could be more complex. String overexpression might affect cell fitness and therefore cell competition could be an issue here. Can this be clearly separated, ruled out? That would be important to address. 9) A more general concern is that novel bits seemed investigated in less detail than the already well established findings. The non-cell autonomous influence of tumour cells on neighbours to direct faster growth is fascinating but not well explored, and the suggestion that stalled cells were transiently senescent and releasing SARPs is too rushed to be definitive. Nonetheless, this is highlighted in the title and Abstract of this paper. Finally, are G2-stalled cells really protected from apoptosis? It seems that both pro- and anti-apoptotic pathways are activated; is knockdown of Hippo/Yorkie signalling in these cells needed? 1) Tribbles-GFP is also upregulated by acute surgical damage, and not only in egr-expressing discs (anterior compartment in Figure 4E). 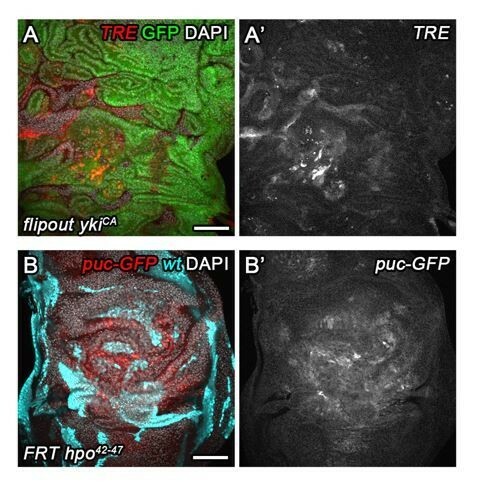 2) Tribbles-GFP upregulation depends on JNK activity, because expression of a dominant-negative BskDN using the enGAL4 driver prevents high Trbl-GFP expression in the posterior compartment of surgically damaged discs (posterior compartment in Figure 4E). 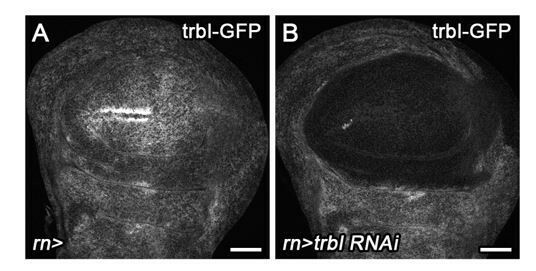 3) A UAS-trbl RNAi line, which efficiently knocks down Trbl-GFP in wing discs (Author response image 1), has little effect on normal wing development (Figure 4—figure supplement 1L). However, trbl RNAi efficiently suppresses G2-stalling in egr-expressing discs and restores a heterogenous cell cycle profile (Figure 4H). Combined, these new data suggest that Tribbles, like Stg, is a rate-limiting effector of JNK for G2-stalling. Thus, it is conceivable that Tribbles may regulate G2-stalling also by regulating proteasomal degradation of Stg protein. Importantly, however, we conclude from the analysis of the stg-GFP trap line that stg is at least transcriptionally downregulated in G2 stalled cells, a mechanism likely unrelated to Tribbles function, which is expected to act on Stg proteins. Since we have been unable to detect Stg protein levels directly (for example an antibody recognizing Stg in embryos (Di Talia et al., 2013) does not detect Stg in imaginal discs, possibly because of different fixation conditions – see discussion to point 4), we cannot make any statement about how Stg protein levels may be regulated in response to tissue damage, JNK or in response to Tribbles upregulation. Based on the literature, Tribbles is expected to also regulate many proteins related to cell growth, cell migration and metabolism (for example (Das et al., 2014; Masoner et al., 2013). Because Stg is a more direct effector of G2/M transitions, we have decided to focus our functional studies on UAS-stg overexpression. We completely agree with the reviewer that previous studies (Harvey et al., 2003; Huang et al., 2005; Tapon et al., 2002) have unequivocally demonstrated that Hpo/Sav/Wts pathway mutants cycle faster and have normal cell cycle profiles. To address this independently, we analyzed ykiCA (ykiS168A.V5) -overexpressing mosaic wing discs (Worley et al., 2013) by flow cytometry analysis (see Author response image 2), confirming that cell cycle profile of ykiCA-overexpressing cells overlaps perfectly with wild type cells. However, TRE-positive wild type and TRE-positive ykiCA-overexpressing cells (both about 12% of the total population) display a pronounced shift towards G2, strongly supporting our conclusion that JNK-activity in any genotype induces G2 stalling. Of note, JNK upregulation in ykiCA-overexpressing is not extensive enough to average into significant cell cycle changes visible in flow cytometry analysis of the entire cell population, also explaining why this shift has not been described in previous studies. Thus, we agree that cell cycle changes in TRE-negative wtsx1 mutant cells could be due to a second site mutation on that chromosome. As we do see an even stronger G2 shift in TRE-positive than in TRE-negative wtsx1 cells, we conclude that this additional shift is due to JNK activity. Because we verify that ykiCA and scrib/dlg/lgl cells stall in G2, we suggest that combined the analysis of all genotypes support our point that tumor suppressor or oncogenic mutations which activate TRE also stall in G2. We previously explored the idea to present adult eyes of dlg1G0342 and dlg1G0342, UAS-stg genotypes. In fact, preliminary experiments suggested that the adult eyes of dlg1G0342, UAS-stg were smaller than in dlg1G0342 alone, consistent with the idea that mitogenic signaling may be impaired. However, this interpretation was limited by possible alternative interpretations related to dlg1G0342, UAS-stg cells failing to differentiate and contribute to adult eye tissues during pupal morphogenesis. We thus decided to not further explore this data at this point in time and to focus on imaginal disc phenotypes. In fact, we are now better experimentally addressing non-autonomous mitogenic behavior in Figure 7 and our response to point 8. Based on these arguments and the extensive old and new data available for wtsx1, we are strongly favoring to focus on the wtsx1 data in the manuscript. We are very confident about the data as we have repeated this experiment multiple times. During the preparation of the manuscript we received feed-back that describing the peripodium in the main results extends the first part of the manuscript at the expense of the important functional data for G2-stalling in the second half. However, we absolutely agree with the reviewer that this is a crucial point in the paper. We included wild type and hepR75 discs of the same size range in our analysis. These discs had statistically similar counts of Ubx-positive cells. 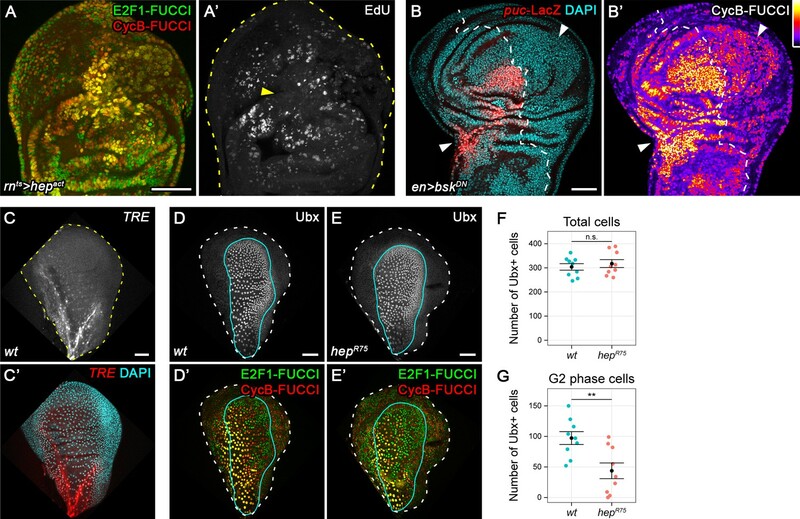 We further improved the cell cycle analysis by using an automated and unbiased approach in FIJI, to measure the fluorescence intensity of the FUCCI reporters in each Ubx-positive cell and thus identify the cell cycle phase. This analysis confirms that there are significant differences in the number of G2 and G1 cells between wild type and hepR75 peripodia. S-phase counts were not statistically significantly different. Combined we conclude, that even though hepR75 discs may have less G2 cells in Ubx-positive domains, cell division rates may not be abnormally increased. This is actually consistent with data by the Edgar lab suggesting that the duration of individual cell cycle phases is intrinsically compensated to maintain the cell cycle length constant (Reis and Edgar, 2004). As above, during the preparation of the manuscript we received feedback that describing the DNA damage data early on extends the first part of the manuscript at the expense of the important functional data for G2-stalling. As we absolutely agree with the reviewer that DNA damage is a crucial concept in cell cycle arrests, we have moved the data to Figure 3—figure supplement 1. We choose to present it in the supplements because our observations align with a previously published paper by the Johnston lab (Wells et al., 2006), who similarly observed that DNA damage is not involved in the regulation of a cell cycle arrest in undead cells (which we think represents the same phenomenon). We now emphasize in the text that JNK signaling is sufficient for G2-stalling but that it may be a downstream effector of cellular damage signals, such as heavy DNA damage or proteotoxic stress. Importantly, however, as JNK signaling during development (which would be independent of a (DNA) damage context) is sufficient for G2-stalling, we conclude that DNA damage could be an upstream regulator (via activation of JNK) but that itself is not necessary for stalling if other JNK-activating signals dominate. Because of the literature on mammalian Cdc25c being phosphorylated by JNK to drive its proteasomal degradation (Goss et al., 2003; Gutierrez et al., 2010), we initiated studies to look at String protein levels using IF and Western blots, and to analyze String phosphorylation levels using Phospho-tag gel shift assays in different genetic backgrounds in vivo. However, we encountered several technical challenges: the stg-GFP trap does not give rise to a functional fusion protein, an HA-tagged Stg protein (FBrf0225451) is only detected in a very short window of the cell cycle (late G2/M) and thus hard to visualize on Western blots, and an antibody recognizing Stg in embryos (Di Talia et al., 2013) does not detect Stg in imaginal discs (possibly because of different fixation conditions). We thus have stopped this line of investigation until we have more resources to investigate Stg protein levels, modifications and activity in imaginal disc. However, we included the references to the mammalian data (Goss et al., 2003; Gutierrez et al., 2010) now in the Discussion because we agree that these studies align with our observations. We address cell competition in our response to point 8. 2) a quantification of the decline in TRE-RFP fluorescence intensity after surgical injury and egr-induced tissue damage demonstrating that JNK signaling after surgical injury declines faster than after egr-expression (Figure 5M-N). 3) In addition, we demonstrate that TRE-RFP levels in wtsX1 mosaic tumor discs increases during larval stages and stays chronically high (Figure 7—figure supplement 1A). 1) The scaling of the TRE signal and G2 increase detected by FACS analysis was already included in the first manuscript version in Figure 2L. We modified the visualization of the data to emphasize this point further. 2) We now also demonstrate that the TRE-reporter is equally active in egr and egr,stg expressing imaginal discs, confirming that JNK activity is not affected by stg-coexpression (Figure 5—figure supplement 1H). We furthermore tested the ability of the TRE reporter to sensitively detect JNK activity dose in vivo. 1) TRE-activity completely co-localizes with other established JNK-effector read-outs, such as MMP1 expression (Uhlirova and Bohmann, 2006) (Author response image 4), suggesting that TRE is a faithful JNK-reporter. 2) Expression of a strong dominant-negative BskDN construct in the posterior domain using enGAL4 (Author response image 5) completely abrogates TRE-RFP activation in the posterior compartment of surgically injured discs (white arrowheads). This recapitulates repression of puc-LacZ in the same context (Figure 3B) and confirms that JNK is the major activator of the TRE reporter. 3) Similarly, co-expression of a dominant-negative BskDN construct in egr-expressing cells (Author response image 6) strongly suppresses TRE-RFP activation in egr-expressing discs. In contrast, egr-expressing discs hemizygous for hepR75 allele have only reduced TRE-reporter intensity. hepR75 is a short deletion around the ATG translation initiation start site (Glise et al., 1995). As the TSS site is theoretically still intact, this deletion could be bypassed by a downstream in-frame ATG that localizes just upstream of the kinase domain, rendering the hepR75 allele a hypomorph. Thus, the TRE reporter responds sensitively to different levels of JNK activity in vivo. We hope that these experiments sufficiently address the concerns raised about our description of JNK activity levels using the TRE-RFP reporter. Because of the literature on mammalian Cdc25c being phosphorylated by JNK to drive its proteasomal degradation (Goss et al., 2003; Gutierrez et al., 2010), we previously initiated studies to look at String protein levels using IF and Western blots, and to analyze String phosphorylation levels using Phospho-tag gel shift assays in different genetic backgrounds in vivo. However, we encountered several technical challenges: the stg-GFP trap does not give rise to a functional fusion protein, an HA-tagged Stg protein (FBrf0225451) is only detected in a very short window of the cell cycle (late G2/M) and thus hard to visualize on Western blots, and an antibody recognizing Stg in embryos (Di Talia et al., 2013) does not detect Stg in imaginal discs (possibly because of different fixation conditions). We thus have stopped this line of investigation until we have more resources to investigate Stg protein levels, modifications and activity in imaginal disc. However, we included the references to the mammalian data (Goss et al., 2003; Gutierrez et al., 2010) now in the Discussion because we agree that these studies are important for our observations. “We first analyzed a GFP trap inserted in the stg locus (Buszczak et al., 2007). […] We observed that expression of the stg-GFP trap was dramatically downregulated in G2-shifted cells in egr-expressing discs (Figure 4A-B’)”. During the preparation of the manuscript we received feedback that describing the DNA damage data early on extends the first part of the manuscript at the expense of the important functional data for G2-stalling. As we absolutely agree with the reviewer that DNA damage is a crucial concept in cell cycle arrests, we have moved the data to Figure 3—figure supplement 1. We choose to present it in the supplements because our observations align with a previously published paper by the Johnston lab (Wells et al., 2006), who similarly observed that DNA damage is not involved in the regulation of a cell cycle arrest in undead cells (which we think represents the same phenomenon). We now emphasize in the text that JNK signaling is sufficient for G2-stalling but that it may be a downstream effector of cellular damage signals, such as heavy DNA damage or proteotoxic stress. Importantly, however, as JNK signaling during development (which would be independent of a (DNA) damage context) is sufficient for G2-stalling, we conclude that DNA damage could be an upstream regulator (via activation of JNK) but that itself is not necessary for stalling if other JNK-activating signals dominate. Thus, we cannot and in fact we do not want to rule out that the DDR is activated. As irradiation also activates JNK in imaginal discs (for example (Pinal et al., 2018)), we suggests that DNA damage could be one of the many signals that drive JNK-dependent G2-stalling, however other cellular damage signals (proteotoxic damage, ER stress, lipid oxidation) may feed into JNK to stall the cell cycle as well. As JNK signaling is involved in cell competition processes (for example (Kucinski et al., 2017), we have in fact been intrigued by how G2-stalling may affect competitive interactions in the tissue. - Stg overexpression causes cells in injured discs to die (Figure 6A). This suggests that driving JNK-signaling cells through the cell cycle may cause them to become losers in this competition scenario. As these experiments would reach opposite conclusions about the winner or loser state of JNK-signaling G2-stalled cells, we had not discussed cell competition in the current form of the manuscript. However, we wanted to more directly test if the lack of mitogenic signals or a gain of super-competitor status in wtsx1, UAS-stg cellsprevents non-autonomous overgrowth of the surrounding wild type tissue. 1) To directly investigate if G2 stalled cells promote mitogenic signaling, we quantified mitotic counts using phospho-Histone 3 stainings in wild type tissue surrounding either wtsx1 or wtsx1, UAS-stg clones (data now included in the manuscript in Figure 7L,M). 2) To investigate if G2 stalled engage in competitive interactions leading to killing of cells, we quantified the extent of apoptosis using Dcp-1 stainings in wild type tissue surrounding either wtsx1 or wtsx1, UAS-stg clones (not included in the manuscript). We found that the area fraction of apoptotic cells mildly increased in both the tumor and the surrounding wild type tissue by UAS-stg overexpression (0.14 ± 0.06 in wtsx1 vs 0.19 ± 0.05 in UAS stg, wtsx1, and 0.06 ± 0.03 in wild type tissue surrounding wtsx1 vs 0.10 ± 0.04 in wild type tissue surrounding UAS stg, wtsx1, n = 5 confocal section from each of n = 6 disc, for each data point). Because both wild type and tumorigenic cells responded with the same trend, it is hard to draw any conclusions about a change in competitive interactions by preventing G2-stalling which affects apoptosis in one population. In contrast, we found that the rate of mitotic events in the wild type tissue is reduced to 50% by UAS-stg overexpression in wtsx1 cells. This strongly supports our conclusion that a reduction in mitogenic signals causes a reduction in non-autonomous overgrowth, when G2-stalling is impaired. Combined, we propose that our data more directly supports a model where G2-stalling promotes non-autonomous mitogenic signals rather than altering competitive interactions in the tissue. Indeed, the mechanisms of how tumour cells influence neighbours to direct overgrowth are only beginning to be understood. Some of the non-autonomous signals implicated in the literature are Wg, Dpp, and JAK/STAT ligands as well as activation of Hippo/Yki signaling (reviewed for example in Enomoto et al., 2015). This aligns with our observation that upd-lacZ (JAK/STAT ligand) and diap1-3.5-GFP (Hippo/Yki signaling) are upregulated in egr-expressing and thus JNK-signaling and G2 stalled cells. Many studies also link activation of initiator caspases to non-autonomous mitogenic signals. ‘Undead cells’, i.e. JNK-signaling cells that are resistant to apoptosis, uncover stimulation of the initiator caspases, such as Dronc, as a source for mitogenic signals that cause overgrowth on chronic timescales. On physiological timescales, Dronc activity functions in directing compensatory proliferation (for example (Chen, 2012; Fuchs and Steller, 2015; Martin et al., 2009; Perez-Garijo et al., 2009; Shlevkov and Morata, 2012; Wells et al., 2006)). These studies link activation of JNK and of initiator caspases, as well as resistance to apoptosis, to physiological and aberrant induction of mitogenic signals. 1) To more directly investigate if G2 stalled cells promote proliferative signaling, we quantified mitotic counts using phospho-Histone 3 stainings in wild type tissue surrounding either wtsx1 or wtsx1, UAS-stg clones (now included in the manuscript in Figure 7L,M). We found that the rate of mitotic events in the wild type tissue is reduced to 50% by UAS-stg overexpression wtsx1 cells. This strongly supports our conclusion that a reduction in mitogenic signals causes a reduction in non-autonomous overgrowth, when G2-stalling is impaired. 2) To investigate if ‘undead cells’ – an established model for non-autonomous overgrowth – are stalled in G2, we generated undead cells using our models by co-expressing p35 in egr-expressing disc. Importantly, these cells display a complete shift towards G2 (Figure 7N), suggesting that undead cells also arrest in G2. Thus G2-stalling is intimately associated with cellular states known to chronically stimulate growth. 3) To demonstrate that caspases are activated in G2 stalled cells and that G2 stalling may confer resistance to the execution of apoptosis, we analyzed the CasExpress sensor in surgically injured discs. CasExpress permanently labels anastatic cells, which have survived caspase activation (Ding et al., 2016; Tang et al., 2012). Strikingly, 24 h after surgical injury, we observed many CasExpress-positive clones near the wound site (Figure 7—figure supplement 2A.). This indicates that many wound-proximal cells survive caspase activation and subsequently proliferate. While we cannot demonstrate that these anastatic cells corresponded to G2-stalled cells, we suggest that G2 stalling could facilitate transient mitogenic signaling of Dronc-positive, JNK-activated cells at wound sites. These markers are hallmarks of mammalian senescent cells. We would thus like to keep senescence in the title but changed the title to “JNK-dependent cell cycle stalling in G2 promotes survival and senescence-like phenotypes in tissue stress”. We also removed ‘SASP’ from the Abstract. With respect to Hippo/Yki signaling: Yki activation by JNK signaling in egr-expressing cells has been previously reported (Sun and Irvine, 2011). This study also describes that knock-down of yki in egr-expressing cells using an RNAi construct completely ablates this cell population and prevents successful regeneration (see Figure 3 in Sun and Irvine, (2011)). Thus, the same population that we identified to be G2-stalled cells depend on the potent anti-apoptotic factor Yki for survival. We thank the reviewers for critical comments on the manuscript. We thank the CALM facility at LMU and the LIC facility at the University of Freiburg for technical help with imaging. Flow cytometry analysis was performed with the help of S Bultmann (LMU München) and V Hilgers (MPI-IE, Freiburg). We thank D Bohmann, B Edgar, K Irvine, G Morata, YH Sun and N Zielke for sharing reagents. We thank the Bloomington Drosophila Stock Center (BDSC), the Kyoto Stock Center (DGGR), the MAB facility at the Helmholtz Zentrum München and the Developmental Studies Hybridoma Bank (DSHB) for providing fly stocks and antibodies. We thank the IMPRS-LS and SGBM graduate schools for supporting our students. Funding for this work was provided by the DFG (CL490/1) and Germany's Excellence Strategy (CIBSS – EXC-2189 – Project ID 390939984), as well as by the Boehringer Ingelheim Foundation (Plus3). © 2019, Cosolo et al.